High-calcium foods, specifically yogurt, can aid in body fat breakdown and reduce stomach fat. High-protein foods also help with weight loss because they keep you feeling fuller longer. Yogurt is a high-protein food that is also high in calcium. A study published in 2005 in the “International Journal of Obesity” found that substituting yogurt for other meals significantly boosts fat loss. 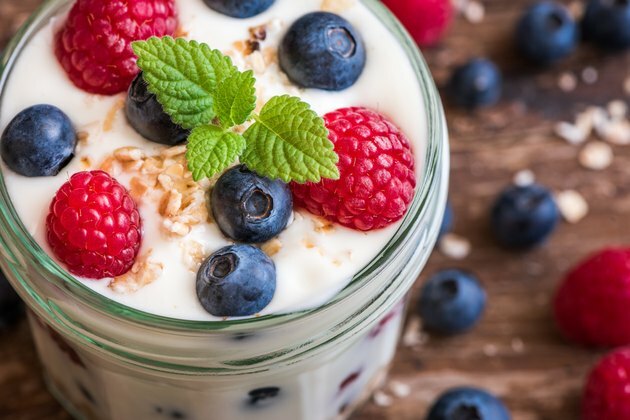 The researchers found that dieters that ate yogurt three times a day lost 22 percent more weight and 61 percent more body fat than those who simply cut calories. Eat plain nonfat yogurt to replace your normal lunch. To lose weight, you need to burn more calories than you eat. One pound is equal to 3,500 calories, so to lose a pound a week, you have to burn or consume 3,500 fewer calories than you normally eat. Add whole grain granola or fresh fruit to your yogurt to make your lunch more filling. Fruit will add only minimal calories. Granola increases the calories; however, it can also make you feel fuller. Make a yogurt smoothie to eat lunch on the run. Blend plain nonfat yogurt with fresh fruit in a blender. Add honey to sweeten the smoothie, if necessary. Ensure that the yogurt you eat for lunch is lower in calories than what you normally would eat. For instance, a serving of Dannon plain nonfat yogurt has approximately 80 calories. The calories in granola vary widely depending on the brand and type. Grape Nuts granola contains 200 calories per 1/2-cup serving. Exercise daily to burn calories. Running, walking, cycling or swimming are all good cardiovascular exercises that can help you lose weight. Consult your physician before making any dietary changes.